During the Reformation, the Book of Psalms became one of the most well-known books of the Bible. This was particularly true in Britain, where people of all ages, social classes and educational abilities memorized and sang poetic versifications of the psalms. Those written by Thomas Sternhold and John Hopkins became the most popular, and the simple tunes developed and used by English and Scottish churches to accompany these texts were carried by soldiers, sailors and colonists throughout the English-speaking world. Among these tunes were a number that are still used today, including ’Old Hundredth’, ’Martyrs’, and ’French’. 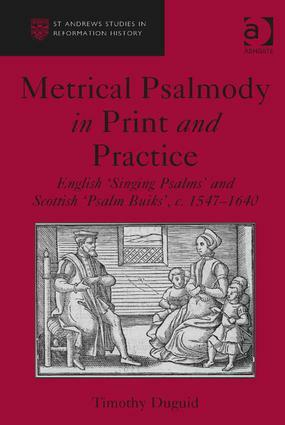 This book is the first to consider both English and Scottish metrical psalmody, comparing the two traditions in print and practice. It combines theological literary and musical analysis to reveal new and ground-breaking connections between the psalm texts and their tunes, which it traces in the English and Scottish psalters printed through 1640. Using this new analysis in combination with a more thorough evaluation of extant church records, Duguid contends that Britain developed and maintained two distinct psalm cultures, one in England and the other in Scotland. Timothy Duguid holds a PhD in Music history from the University of Edinburgh. He worked for three years as the research assistant for the celebrated Wode Psalter Project at the University of Edinburgh, and he is currently a researcher for the Initiative for Digital Humanities, Media, and Culture at Texas A&M University. With the publication of its 100th book in 2012, the St Andrews Studies in Reformation Studies series celebrated an impressive publishing achievement. Since its establishment in 1995 the series has consistently offered high-quality, innovative and thought-provoking research in the field of early modern religious history. By encouraging authors to adopt a broad and inclusive interpretation of ’Reformation’, the resultant publications have done much to help shape current interdisciplinary interpretations of early-modern religion, expanding attention far beyond narrow theological concerns. Each title within the series has added to a body of international research showing how the ripples of the Reformation spread to virtually every corner of European society, both Protestant and Catholic, and often beyond. From family life, education, literature, music, art and philosophy, to political theory, international relations, economics, colonial ventures, science and military matters, there were few aspects of life that remained untouched in some way by the spirit of religious reform. As well as widening conceptions of the Reformation, the series has for the last fifteen years provided a publishing outlet for work, much of it by new and up-and-coming scholars who might otherwise have struggled to find an international platform for their work. Alongside these monographs, a complementary selection of edited volumes, critical editions of important primary sources, bibliographical studies and new translations of influential Reformation works previously unavailable to English speaking scholars, adds further depth to the topic. By offering this rich mix of approaches and topics, the St Andrews series continues to offer scholars an unparalleled platform for the publication of international scholarship in a dynamic and often controversial area of historical study.